Alan Webb is the only character I am profiling who is not a member of the eight. The reason will be immediately obvious to anybody who reads the story: the gang's enmity for Paul Adams' erstwhile mucker is the chord which binds them together during this their second rideout. He alone had been the reason for the gang's demise the first time around, of which we know only a limited amount, and he is equally the cause of its coming together for a second time – older, wiser and rapt by the most beautiful summer that living man had encountered before or since. But there is another reason why I feel the need to grant special status to Alan Webb. When discussing The Best Year Of Our Lives with friends and acquaintances who have been kind enough to read it and offer me feedback I have been overwhelmed, if not entirely surprised, by the amount of sympathy that this character in particular has provoked. "I feel sorry for that person you bullied," said one, confusing me as author with the lead actor. "I liked Alan Webb much more than I liked Paul Adams," admitted another. I have to confess this wasn't entirely unintentional on my part. The negative portrayal of Alan Webb throughout most of the book was only ever intended to reflect the view of him taken by the one through whose eyes the story was told. He begins the tale as Alan, is relegated to Webb before becoming Alan once again with a handshake and an awkward reminisce. But through it all he is stoical, courageous and admirably defiant in his predicament. He has to suffer, in order that the gang might thrive. He is the blood sacrifice of a halcyon adventure. That is the simple dynamic, the reader was never meant to hate him. Alan Webb brings out the leader in Paul, the loyalty in Jim, the affection in Tina and the infant heroism in Pete. Unwittingly he is the catalyst for great things, for an explosion of love made magnificent by a common if oft exaggerated hatred. Some would see him as one of the most noble characters in the book, and I always intended it that way. Alan doesn't leave the story in as dramatic a style as he first entered it, but he is thematic to it throughout. Wherever he is today, I wish him well and I'm sure Paul Adams would feel the same. Click here now to order your copy of The Best Year Of Our Lives in paperback (£9.99) or ebook (£5.99). I'd be very grateful if you'd kindly write me a review - even a few short words will suffice - by clicking here. It is, officially, the most exciting year to be alive, made more perfect still by the most glorious summer in living memory. 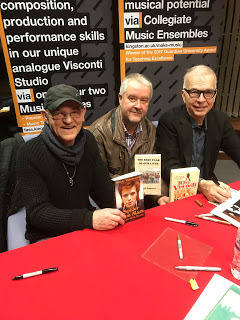 From the streets of a historic and restless Middlesex suburb, on the tide-washed banks of the Thames, an everyday young man into God, Bowie, Steve Harley, football, fishing and fighting leads his companions on a fantastical and beautiful mission that has no name. As they surf the zeitgeist and reach for the stars, no foe can withstand their will… except for one. 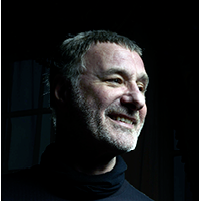 Steve Harley (Cockney Rebel) on "The Best Year Of Our Lives"
"I've read it from cover to cover, almost without a break. Over two days, you have entertained me riotously. "It must have been a slog, labouring through an opus of 400 pages, but, trust me, it was worth it." - legendary singer and songwriter Steve Harley. "As a writer and editor, I am very impressed with this debut novel. I wasn't sure I was going to like the book when I first started it because it is very British and there were things in the story that I didn't understand. However, the exceptional quality of the writing and the excellent characterizations kept my interest...I highly recommend it!" - Susan Stewart (US author and editor). "Just finished the book 'The Best Year Of Our Lives' by Phil Andrews. I have never, laughed, wanted to throw a punch, feel 'blue' and cry so much for ages." - verified Amazon reviewer. "A compelling account of a teenage Camelot...a rich tapestry of life in 1970s Britain - the music, the fashions, and that memorable long hot summer of 1976." - Ray Burston (UK author of The Summer Of '76 and eight other titles). "The spirit of the times.... captured well. If you were around then it's a great reminisce. But if you weren't a story of adolescent group dynamics that is familiar to all. Check it out." - Michael (verified Amazon reviewer). "Totally loved the book, so laid back, enjoyable read. First class." - David Squire (verified Amazon reviewer). "Thoroughly enjoyable read about teenagers in an era now long gone." - verified Amazon reviewer. "The content of this book...is awesome. Seriously, it is completely unputdownable." - Mark Tamar, The Spirit of 1976. "The Best Year of Our Lives is an immersive, richly detailed read that puts you there at the heart of the gang as they hang around the youth club and the streets of West London in those far-off days." - verified Amazon reviewer. "I don't do novels. My reading is restricted to biographies and factual stuff. In fact I don't think I've ever managed more than two chapters of a novel before. But this book was highly recommended and I'm very glad it was! An easy read, but very cleverly written. Because even if you don't spot the clever bits, you will still be thoroughly entertained and will struggle to put it down. Buy it, read it - you will not be disappointed! - Phil L (verified Amazon reviewer). "What wows me is that this story can be enjoyed on every level, as a simple fond reminisce or as a tentative journey into the recesses of the over-active young mind. Or to put it another way, it can equally be enjoyed or psycho-analysed. Most of all the special genius of this book is the way in which the author hurls himself into the main character to the point where we are sometimes not quite sure which of them is speaking to us. Yes he openly tells us the story was inspired by his own childhood but he doesn't always keep his distance. I wouldn't be surprised if that is deliberate." - Paul Latchmore, Goodreads. "My formative years coincided with those in this book and I was transported to that time and place with memories popping back into my head with every page turned. Regardless of the age of the reader, I feel there is something in this book for all - a picture painted of a simpler, more innocent world of teenage escapades without the complexities of mobile phones, x-boxes and the like. A damn good read!" - Richard Andrews (no relation! ), (verified Amazon reviewer). "A well written, brilliant book, very good read, enjoyed it from beginning to end." - Janet Short (verified Amazon reviewer). "A great read, took me back to the 70s" - Graham Nicoll (verified Amazon reviewer). "The time's memories came flooding back of the wonderful, free and innocent life we youngsters were able to lead at that time. 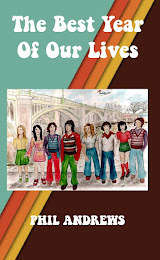 A great book, story and a must read for anyone who was a teenager in the 70s." - Michael Dance (verified Amazon reviewer). "An excellent read, I thoroughly enjoyed it from start to finish. Captures the era perfectly." - Il Padrino (verified Amazon reviewer). "A gorgeous feeling of yearning accompanies this journey through that hardest of times, the ages between twelve and fifteen, particularly if it was 'your era'. An air of innocence still surrounded us then, and this lovely novel illustrates this so well...a long, beautiful meander by the metaphorical river of life." - Diana Wilde (Author, The Glam Rock Files). "The book is an absolute powerhouse of a debut novel which deserves to be picked up by the mainstream. So beautifully prosaic from start to finish, flitting seamlessly between everyday teen street parlance and pure poetry as one chapter rolls into the next. A breathtakingly creative retro tour de force." - Paul Latchmore on Facebook.